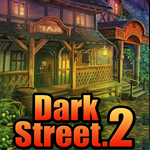 Games4King - Dark Street Escape 2 is another point and click room escape game developed by Games 4 King. Assume that you moved to new city. As it’s a new place for you and so you couldn’t sleep at night. So you started walking at night to get fresh air. While you were walking, lost track and the road ended up in a dark street. So use your skills by collecting necessary items in the dark street to find the right way to go to your new home. Good luck and have fun! Green sliders start at 1 not 0. Hi AO. Paper clue which I think came from letter code on bed used for 4x4 grid. I have changed all the pink circles to green, but nothing else happened and I still have the paper clue. Used the paper clue again and it worked this time. Use magnifying glass on blue striped mirror. Use small gold key on wood stove in same room as mirror. Use magnifying glass in 4x4 grid room. Use colors placing color balls from 1st room (far right room) over bed with letter puzzle. Note: last color is purple, not blue. Thanks Maximom for key hint. That gave me my last ball for colour code. Placed 5 green gems in puzzle in coloured balls room. Green crystals go on puzzle board in 1st room, far right room. Don't need to zoom to place crystals, but after crystals are placed, puzzle can be zoomed. methanwy, you are more likely a step ahead! I am a slow poster. Gems puzzle gives last 2 green globes. And out. Slider not as bad as I thought, also made it out! Thanks AlphaOmega, for leaving hints to get me started! The slider's not so bad Maximom if you get three greens together out of the way in a corner. Get the other two in place, then rotate the three into place. I'm off now. AlphaOmega , Whats the right numbers from clock ? 12:55 ??? It doesnt work for me.